There’s nothing wrong with a classic game like Hangman, but I can appreciate a twist every now and then. 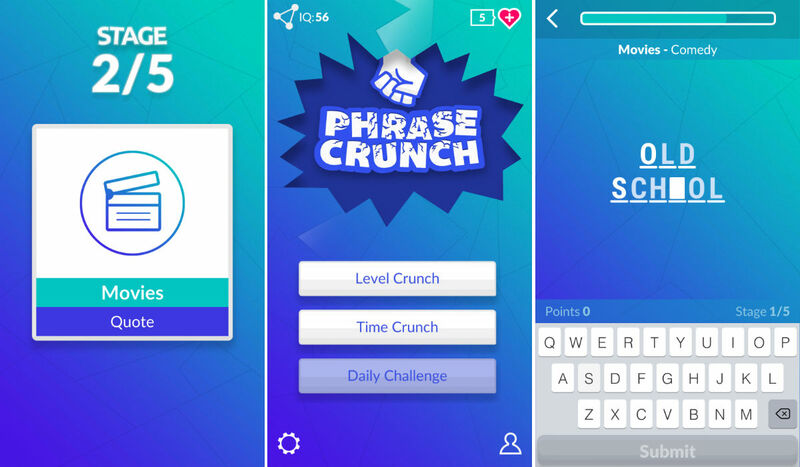 One title that has a good twist to the classic is Phrase Crunch, available for free on Google Play. Similar to other phrase or word guessing games, Phrase Crunch lays out a letter grid. However, instead of guessing each letter yourself, single letters are added until the timer runs out or you answer correctly. Depending on your mastery of different categories (brands, TV, phrases, etc. ), these can be easy or quite difficult. Your end score is based on how quickly you answer the puzzle. Should you score highly, you’ll unlock the next set of puzzles and can also unlock new categories. Also, what good would an awesome score do you if there are no leaderboards? In Phrase Crunch, there are leaderboards, plus something called Crunch IQ. This number will help you determine just how good you are at the game. The game is free to download and play, but IAPs are present for removing ads (pretty minimal ads from what I saw) and getting more lives. Check it out if you want a good time killer.